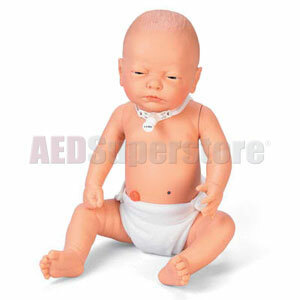 Life/form® has developed the Special Needs Infant Manikin for training in a wide range of fields. Nursing students can focus on the specific but gentle care required when dealing with special needs infants, including performing vital medical procedures. This newborn-size infant is designed to help healthcare facilities and medical staff teach and learn special procedures and develop a nursing care plan for special needs infants. It has also been developed for a wide range of educational training, including beginning nursing students. Medical devices that can be used include: tracheostomy tube and suction catheter, gastrostomy tube, nasogastric tube, and urethral catheter. Other general cares that may be practiced include: bathing, diapering, and various dressing changes. Five-year warranty. Soft carry bag included. Tracheostomy and gastrostomy tubes not included. Carry bag included. Ostomy tubes not included. Five-year warranty. Choose Light or Dark Skin Tone in dropdown window above. Tubing and catheters NOT included.